I love all the different varieties of seasonal produce that are available every fall including winter greens, cabbage, brussel sprouts, and of course winter squash. Pumpkin, one of my favorite varieties of winter squash, is rich in potassium, fiber, and vitamin C. and is wonderful roasted, used in soups or stews, or mixed with other vegetables. I roasted cubes of pumpkin for this salad and mixed it with peppery arugula greens, which I then dressed with a light maple syrup kissed light vinaigrette. 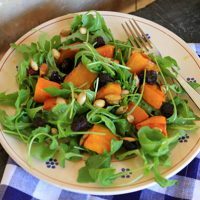 You can use either baby spinach or arugula as your choice of greens, and although I use the pumpkin seeds I toasted after I scooped them out of my pumpkin, toasted walnuts are also great in this salad. 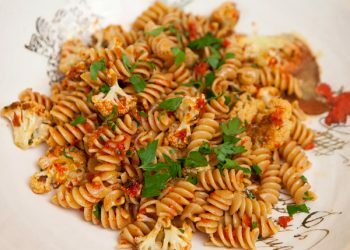 I buy my dried fruit from Trader Joe’s and love their dried cherries which worked really well in the salad but dried cranberries would be a good substitution for the cherries, and would make this salad a great Thanksgiving option. Although I like my roasted pumpkin salad exactly as I show in my photos, you could also top it with some crumbled feta or goat cheese and both cheeses would work well with the sweetness of the pumpkin. 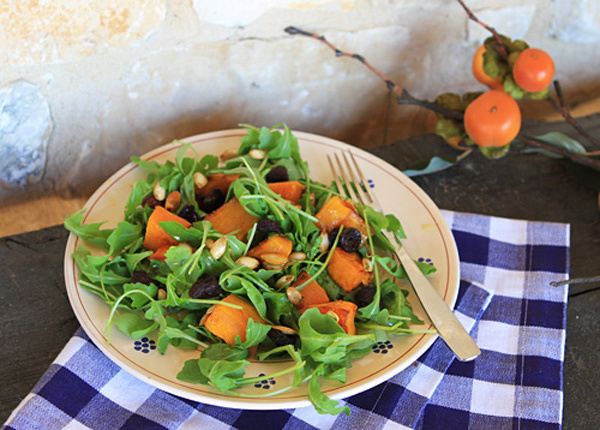 Roasted pumpkin turns an ordinary salad into a very special fall treat! Toss the pumpkin pieces with the two tablespoons olive oil and season with salt and pepper. Spread the pumpkin across a foil lined baking sheet and bake for about 35 minutes or until the pumpkin is tender when pierced with a fork and is beginning to brown. 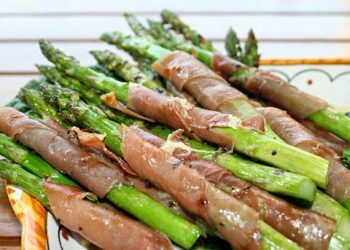 In a small bowl whisk together the ingredients for the dressing. 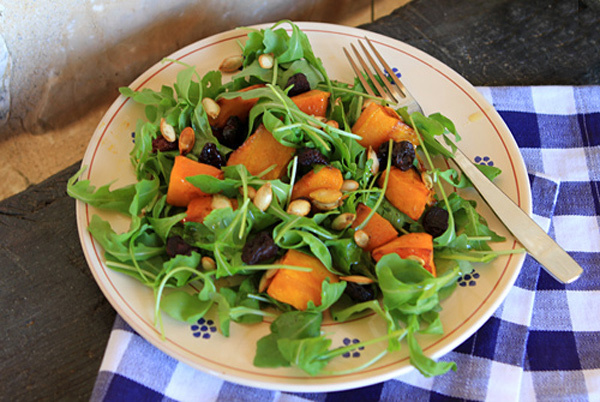 Place the arugula, pumpkin pieces, pumpkin seeds, and dried cherries in a bowl and drizzle with the dressing. 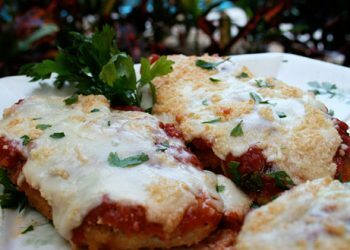 Toss gently to mix, and then divide evenly between four plates.